In December 2014, the Associated Builders and Contractors (ABC) issued a news release projecting a continuation of the “brisk industry recovery” that was experienced in 2014. The growth is expected to continue at least until the end of 2015. The largest growths will be in spending for power, particularly in non-residential construction like natural-gas pipelines and industrial manufacturing. This bodes well for both the construction and welding industries across the United States. Entrepreneur magazine projects an increase in construction projects due to the demand for sustainable and efficient energy. In fact, due to government subsidies and tax benefits, the demand for both residential and non-residential construction projects is expected to substantially increase. The good news ripples through Oklahoma with increases in job opportunities for those who have completed a welding program. The more the construction industry thrives, the more welders will be in demand. Furthermore, experienced welders with welding technology degrees are needed to be welding inspectors. 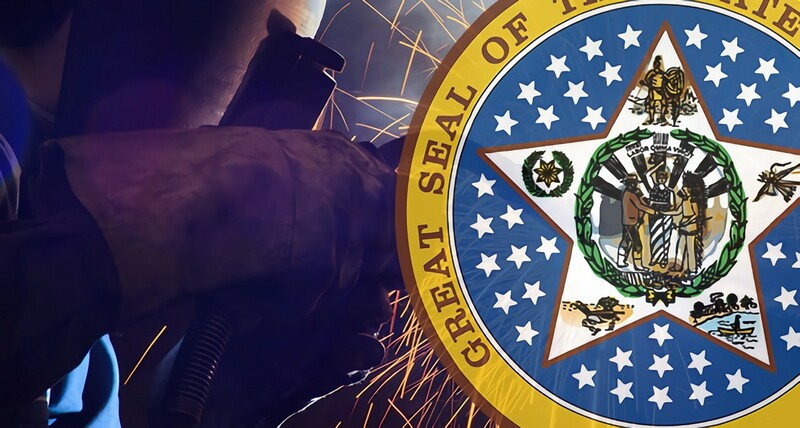 According to a publication by the Oklahoma Employment Security Commission Economic Research & Analysis Division, the Oklahoma Employment Outlook for 2018, jobs for Welders, Cutters, Solderers and Brazers rank in the top 30 demand occupations for 2008-2018 with an anticipated 480 new jobs becoming available every year. This is more than double the growth rate for all other occupations in the state. At the Oklahoma Economic Outlook Conference held in December 2014, Dan Rickman, an economist at Oklahoma State University, projected a major job growth in the Oklahoma construction industry beginning in January 2015. He foresees that at least 3,000 more construction jobs will be available. This does not include the number of welding jobs that will increase due to the increase in oil pipelines affecting Oklahoma. Cushing in Oklahoma has long been one of the world’s biggest oil hubs and is even referred to as the “Pipeline Crossroads of the World.” Here, crude oil is mixed to different grades and then sent off to various refineries. Due to the various pipelines being built that will feed into Cushing for mixing and shipping, openings for construction and welding positions are expected to increase for both pipeline and oil depot work in Cushing. The Grand Mesa Pipeline, which will begin in Weld County, Colorado and run 550 miles to Cushing. It is expected to move more than 130,000 barrels of oil per day. White Cliffs Pipelinealso travels between Colorado and Cushing, transporting more than 150,000 barrels a day. The pipeline is 527 miles long and uses pipes that are 12 inches in diameter. Flanagan South Pipeline has only recently completed construction. It originates in Pontiac, Illinois and travels across Missouri and Kansas before ending in Cushing, Oklahoma. The pipeline uses 36-inch diameter pipes, runs more than 590 miles and transports 585,000 barrels a day with a goal of reaching 880,000 per day. The politically controversial proposed Keystone XL pipeline will—if approved—begin in Canada and extend over nearly 1,200 miles down to the Gulf Coast. The first leg will end in Nebraska. It will use 36-inch diameter pipes and transport 830,000 barrels of oil a day. It is expected to be completed within two years upon approval of the pipeline. During construction, approximately 13,000 workers will be employed, with at least 9,000 of these jobs allocated for those who are skilled in welding and construction. Indirect and direct jobs will be available for another 42,000 workers. The Southern portion of the Keystone Pipeline is the Gulf Coat Pipeline. It begins in Cushing and transports 700,000 barrels a day through 36-inch diameter pipes to Southern refineries 450 miles away. While the Keystone XL pipeline plan would expand job prospects for those employed in the Oklahoma welding and construction industry, the Sooner State already boasts plenty of opportunities for skilled welders and other construction professionals. If you have completed your welding training and are looking for stable and lucrative employment, Oklahoma is one of the most promising destinations in the country for those working in welding and construction. Tulsa Welding School is a vocational school that trains students for careers in welding. The campus is conveniently located for aspiring welders in Tulsa and surrounding areas, including Oklahoma City, Norman, Broken Arrow, and Tuttle.